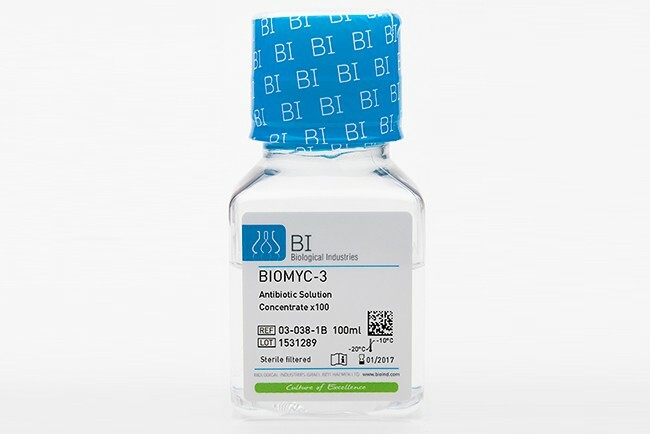 BIOMYC™-3 Antibiotic Solution is a treatment based on the antibiotic Ciprofloxacin. This antibiotic belongs to the Fluoroquinolone group that inhibits synthesis of the enzyme DNA gyrase, which is responsible for supercoiling in bacterial DNA. The treatment consists of adding the antibiotic to the growth medium for 12 days and changing the medium every three days. On completion of the treatment, the cells should be grown on media without antibiotics for at least two weeks and then re-tested for the presence of mycoplasma. If the culture tests positive, the course of treatment should be repeated. Treatment with Ciprofloxacin does not damage or alter the cells. This antibiotic should not be used repeatedly in cell cultures; otherwise, the mycoplasma is liable to develop resistance to it. Add 1 ml BIOMYC-3 to 100 ml medium. 2. Continue the treatment for a total of 14 days, while changing the medium (containing BIOMYC-3) every 2-3 days.